Salt is in the news again. Thomas Frieden the head of the CDC published an article in the JAMA innocuously titled Sodium Reduction—Saving Lives by Putting Choice Into Consumers’ Hands. It more closely resembles propaganda than science. 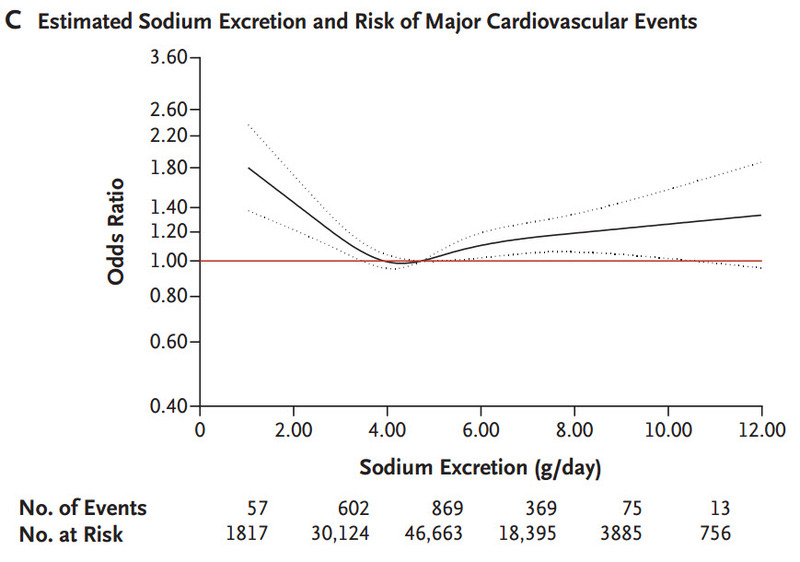 It argues that reducing dietary sodium intake to 1200 mg/day or less will lower the incidence of hypertension and cardiovascular disease by the millions. I’ve already written about this several times and won’t repeat the flaws in this argument again. What I wish to comment about is Dr Frieden’s selective use of the medical literature, so flagrant in its disregard of evidence that it doesn’t like as to deserve a stronger modifier than selective. Two important studies on the association of salt with hypertension and cardiovascular disease are not quoted in his piece. They are Association of Urinary Sodium and Potassium Excretion with Blood Pressure and Urinary Sodium and Potassium Excretion, Mortality, and Cardiovascular Events. They were both published in 2014 in The New England Journal of Medicine. Three figures from the second of these articles are reproduced below. 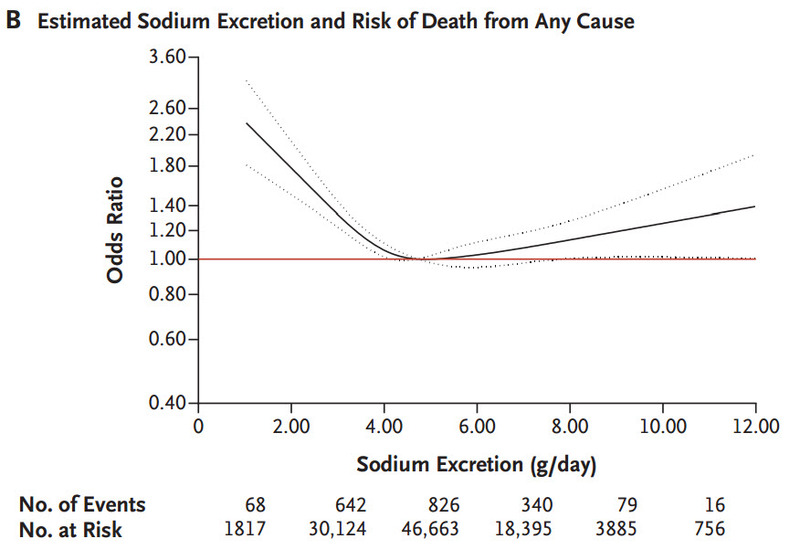 Since virtually all sodium ingested is excreted in the urine, sodium excretion was used as the marker for sodium intake. 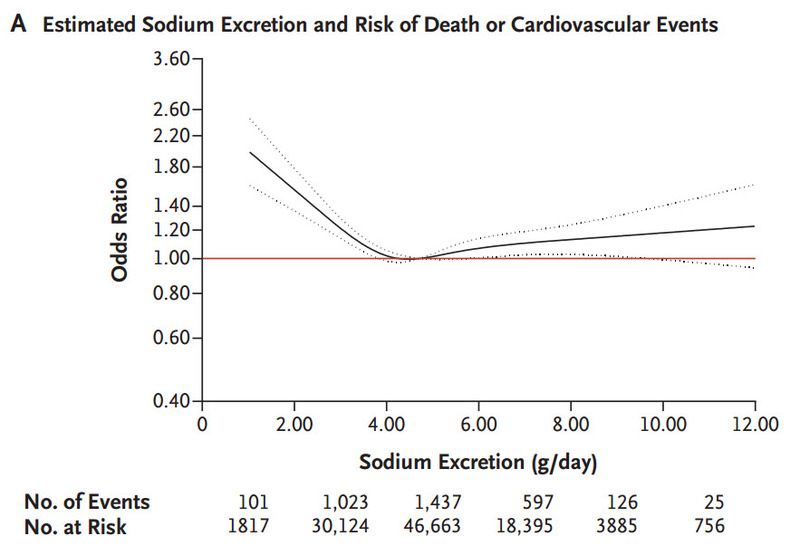 As is easily apparent, the likelihood of death or serious cardiovascular disease was least likely at sodium excretions of 4-6 grams per day – far in excess of what Dr Frieden recommends. A serious physician charged with the safety of the nation should have been expected to at least mention these observations. I can’t get inside of anyone’s head, but I suspect that he ignored data that he felt would undermine his strongly held belief that even a little bit of extra salt would put the people’s’ health in severe jeopardy. Recall that before he came to the CDC, Dr Frieden was the head of New York City’s Health Department, where one of his priorities was trying to limit the size of soda containers. The true believer is ubiquitous in what passes for medical science. I also wonder why the editors of the JAMA didn’t ask Dr Frieden to consider alternatives to his thoughts about dietary salt. I suppose they thought the science was settled. The government is fully committed to the belief that salt is harmful and that everyone within its borders should limit its intake. The truth is that the response to dietary salt varies from one individual to another and that recommendations about its intake should be individualized. Such an approach is usually not appealing to bureaucrats. How much salt should you consume? It depends. Take your blood pressure, if it’s normal (we can fight over what’s normal another time) and you are healthy, eat away. “his strongly held belief”…..religion of antisodiumites………..